Whenever someone is interested or asks the questions about “How to get better sleep”, I often offer my help. (I have spent much time learning how to get the best sleep). We take a look at various things of interest such as: Better quality mattresses, the correct mattress, pillows, protectors and accessories. I have spent much time and energy finding the correct products along with general guides to proper or correct sleep. It’s surprising how many people have never really taken the time to get that type of information. After all, a third of your life is sleeping and good sleep is essential to health, happiness and even success. Of course adjustable beds are a great improvement over tradition beds. However there are even more ways to help improve sleep. 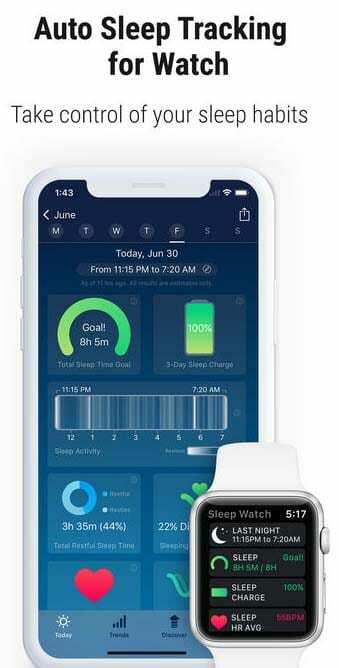 This APP allows the user to monitor many things such as: how much deep sleep they are getting and how much of a dip in heart rate you have. It also offers suggestions such as “Try not to eat right before bed”. (That one was a wake up call to me) (No pun intended). There are many other things that you can learn from this APP which will help your sleeping patterns. If you are not up to date on having the correct mattress, proper pillow, sheets, adjustable bed, correct sleep positions and latest sleep technology……. Come by and let’s talk. I can help improve your sleep!